Today marks the 105th anniversary of the death of Mark Twain. 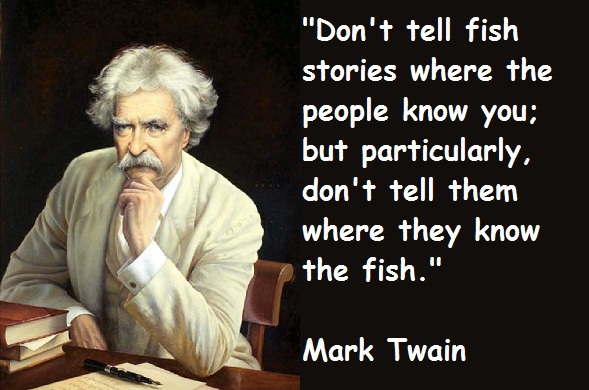 Mark Twain was/is my writer. My favorite of his works are “Life on the Mississippi” and “Roughing It”. I can pick up either book at any time and reread just a few parts to spark my creative juices. His story-telling helps me find my inspiration, my voice, and re-kindle the joy of writing, if lost. I’ve been asked how a meeting with Twain and I would go, do I think we would have anything to talk about. Honestly, I can’t imagine I would have anything to offer to him, but I’m sure that a few questions of the Big River or of Virginia City would conjure stories from Twain that he never had time to write. I believe I would buy drinks for as long as he would speak and he would speak for as long as I bought drinks. I do not know if there is another writer that I could say the same about. Except for maybe Hemmingway, but that would most likely end up in a fight, which he would probably win, but we would end up in a fly fishing discussion. I guess my writers were not just writers. They were people I would want to hang out with and hear their stories first hand. I hope that I am can be the same type of writer.